According to ultimateracinghistory.com Tony d was listed as a co-driver with Don Eichstaedt in the 66 Marlboro T/A race - 23rd o/a. Then I stand corrected. Thanks, Robert. I was confident that Tony hadn't raced his own Corvair in T/A but hadn't thought about him being a co-driver in someone else's car. Just a few additions to this discussion....Donna Mae Mims entered a Corvair in a TransAm once ....I think in Missouri ...DNF ...I recall Brock Yates in that race in a Dodge Dart. Tony D's Corvair was a 1965 , ran as an A/ Sedan..he told me it gave him his first of many race wins..I think at Nelson Ledges.. As a favor , Don Yenko gave him a Yenko Stinger ID tag later and Tony traded the car to his dentist for dental work ! That car now belongs to a friend in Maryland...who also has a red/red ( rare combo )1969 COPO Camaro. The Sebring Stinger referred to was raced by Russ McGrotty, a Chevy dealer in N Y ..co-driven by Art Riley, ( better known as a superb Volvo racer ) and a close friend of Don Y. Mark, Donna raced at Marlboro in '66 as a co-driver in Spurgeon May's Corvair. Some results show William "Bill" Clay as his co-driver but I think that was an error for that particular race. Donna does not show up in results for the Missouri race, at least the ones that I found anyway. While not an official SCCA Trans Am race, a Yenko Corvair Stinger did run in Les 4 Heures du Circuit Le Circuit Mont-Tremblant. This was a four hour race for Trans Am type cars held on May 21, 1967 at Circuit Mont-Tremblant, Mont-Tremblant, Québec, Canada. According to the race results clipping, originally posted by Jon Mello in the 1967 season review thread, Donna Mae Mimms was the driver. The car did not finish the race, stopping on lap 18 due to ignition and clutch failure. You can see the rear end and the striped roof of the white Stinger parked behind the Camaro in the first picture. The front end of the Stinger can be seen at the top of the second picture above the roof of the Mustang. The front end of the Stinger can also be seen to the upper right in the third picture above the hood of the Falcon. Scott, Donna's car was pink and the one you can barely make out in the top picture is her car but the white car in the other two photos is not. Sorry 'bout that. I should have known her car was pink. In addition the white car does not even have the traditional Stinger stripe. 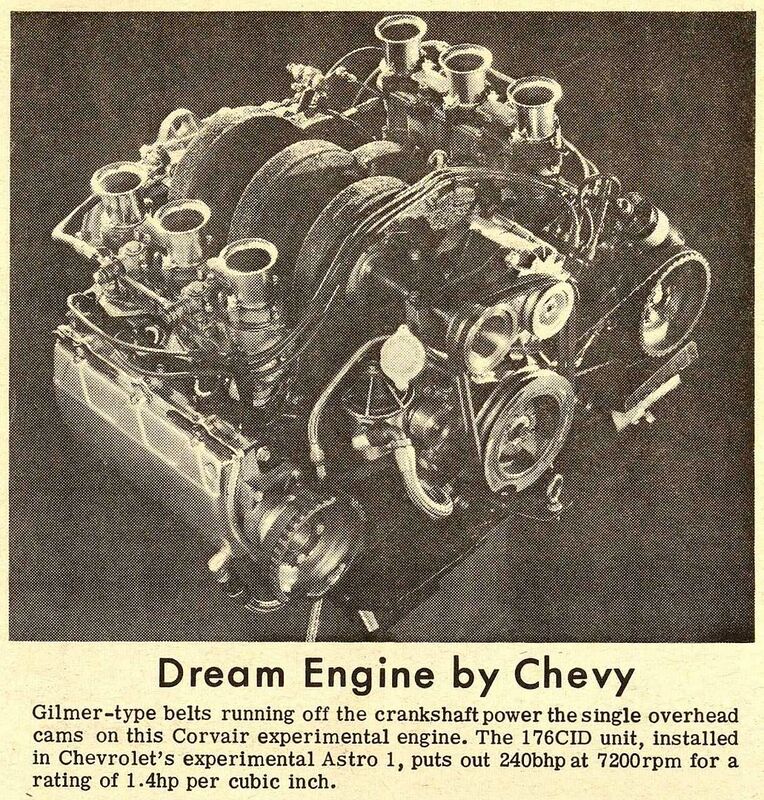 It's probably just a regular street driven Corvair. Thanks for the correction Jon. 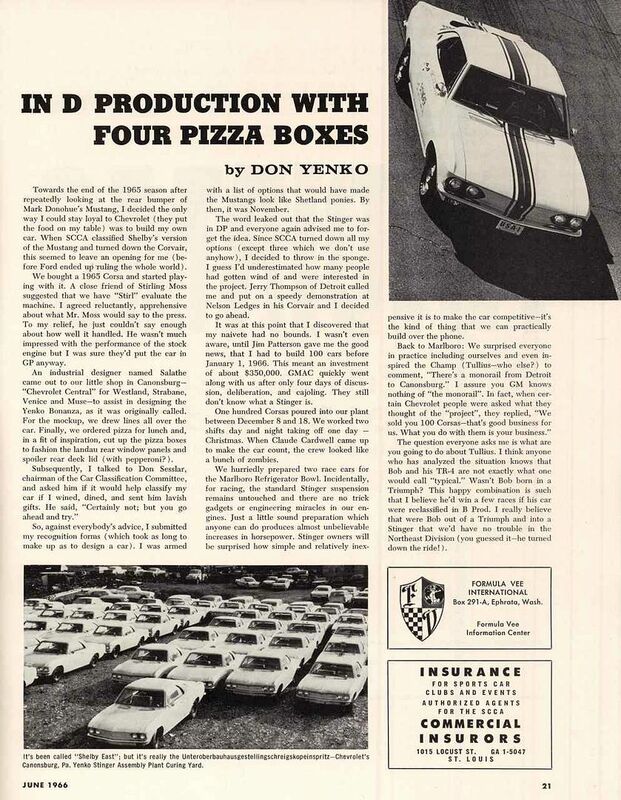 Nice article from SCCA's Sports Car magazine on the introduction of the Corvair Stinger and written by no less than Don Yenko himself. All Corvairs, including Stingers were classified as sedans under FIA rules when raced in Canada... Touring group II.